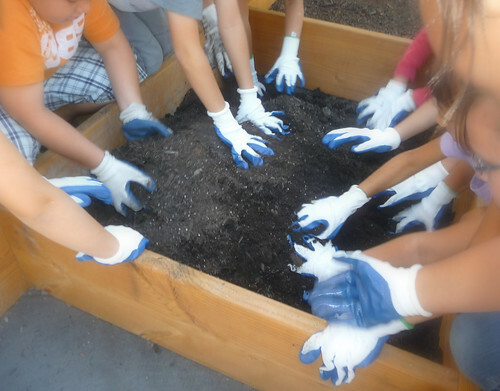 Teacher Lucy Popson's Third Grade "Caring Crew" revitalizes their school garden in Tucson, Arizona. The NLI Model Classroom Program is now in its third year, and teachers across the country are challenging their students to respond to real issues in their schools and communities. Following are two examples of how Model Classroom teachers are using the greater context of addressing real world problems to cultivate critical thinking habits, as well as reinforce reading, writing, math and other fundamental skills. Lucy Popson in Tuscon, Arizona is challenging her third graders to identify a local need and work collaboratively to advocate for and take action on the issue. As students prepare for this challenge, they are active "Caring Crew" members, a team that is invested in the school through projects including teaching other students and revitalizing the school garden; and responsive to the community through fundraisers for the Humane Society and "Days of Caring" that meet locals needs, such as leaf raking for elderly citizens. Read more about Lucy's work on the Model Classroom blog, here. Across the country in Warren, Vermont, Katie Sullivan is asking her students a tough question: Should their town place a parcel of land forever into conservation, or open it up for development? 3rd and 4th Grade students at Warren Elementary will have to make a decision, then persuade their Town Council during a public meeting. Read more about Katie's work here. Stay tuned as more inspiring projects are introduced in the upcoming weeks and months.